Bert Hansen, professor of history at Baruch College and author of Picturing Medical Progress from Pasteur to Polio: A History of Mass Media Images and Popular Attitudes in America, wrote today’s guest post. Dr. Hansen will give a Friends of the Rare Book Room talk, “Louis Pasteur: Exploring His Life in Art,” on January 14. Join the Friends and register for the talk by clicking here. At the start of every New Year, people’s attention turns to health and safety (a popular New Year’s resolution is to lose weight). And as we again confront the passage of time, thinking about what’s permanent and what is not, ephemera come to mind. Printed materials of temporary use, when they have luckily been saved and not casually discarded, are especially important for historians as sources to understand ordinary people’s life in the past. In that spirit, it is a pleasure to share with blog followers a sampling of Lucky Safety Cards from the 1950s, recently donated to NYAM’s Rare Books and Special Collections. Card 45, featuring Popeye. Click to enlarge. 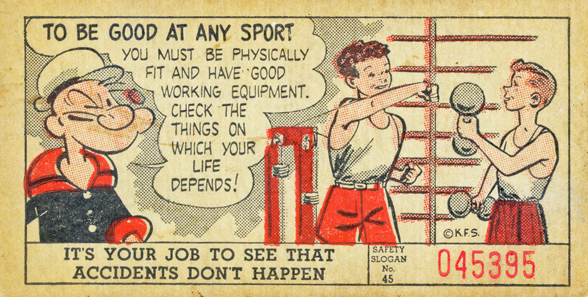 Distributed free in newspapers around 1953, these 2-by-4-inch cards featured characters from popular comic strips and offered ways to be smart and prevent accidents.1 Although children appear in the frame with such cartoon characters at Popeye, Dagwood Bumstead, and the Katzenjammer Kids, it seems likely the messages were aimed at adults as well since people of all ages read newspaper comic strips assiduously. Modern readers may be struck by the formality of language and styles of dress, quite different than the comics’ drawing styles and casual language used from the 1960s onward. And if the points appear less flashy than modern public service announcements, we would still do well to heed most of their concerns. Each card supplements the illustration with two short texts: a very brief general rule at the bottom (suitable for memorization, perhaps) and a more concrete explanation within the frame. The rules were often puns or contained a rhyme. Each card carried a safety slogan number from 1 to 48 identifying its message (and perhaps encouraging people to collect a complete set), along with a unique serial number. The serial numbers were part of a lottery offering cash prizes. Readers were advised to check for the winning numbers in the newspaper. It is not clear how many newspapers distributed Lucky Safety Cards. All the examples in NYAM’s collection come from three newspapers: the Albany Times-Union, the Baltimore News-Post and American, and the New York Journal-American. The Academy holds 31 of the 48 published cards. Missing numbers are 5, 12, 13, 16, 17, 19, 21, 24, 26, 28, 29, 31, 33, 34, 37, 39, and 40. If you have one of the missing cards and want to help fill the seventeen gaps in the set, donations will be warmly received and greatly appreciated. Card 3, featuring the Katzenjammer Kids. Card 4, featuring Little Iodine. Although in the truest sense of the word, these cards were ephemeral, historians and artists now—and long into the future—will have permanent access to them thanks to modern conservation and preservation practices in the Academy Library’s Rare Books and Special Collections. Thanks to a “New Yorker who enjoys flea markets,” our set of Lucky Safety Cards is one card closer to completion. Here’s card No. 24 from the set. Lucky Safety Card 24. Click to enlarge. Our collection now includes cards 13, 17, 29, and 39, thanks to Diane DeBlois and Robert Harris. Just 12 more cards to go! 1. For a handy orientation to the wide range of advice and information in comics formats, see Sol Davidson, “Educational Comics: A Family Tree,” in the open-access journal ImageTexT 4:2, Supplement (2008) at http://www.english.ufl.edu/imagetext/archives/v4_2/davidson/. 2. Michael Rhode, “She may look clean, but. . . . Cartoons Played an Important Role in the Military’s Health-Education Efforts during World War II,” Hogan’s Alley, 8 (Fall 2000). Two entries in Hidden Treasure: The National Library of Medicine ed. by Michael Sappol, Bethesda, MD: National Library of Medicine / New York: Blast Books, 2012: “Malaria Pinup Calendars (1945): Frank Mack, for the U.S. Army,” on pp. 172-173, by Sport Murphy, and “Commandments for Health (1945): Hugh Harman Productions, for the U.S. Navy,” on pp. 174-175, by Michael Rhode. Many fascinating examples are listed in a ten-page finding aid for materials in the Otis Archives Collections, “Cartoons and Comics in the National Museum of Health and Medicine” by Michael Rhode, which may be accessed in PDF format at http://www.medicalmuseum.mil/index.cfm?p=collections.archives.collections.index. 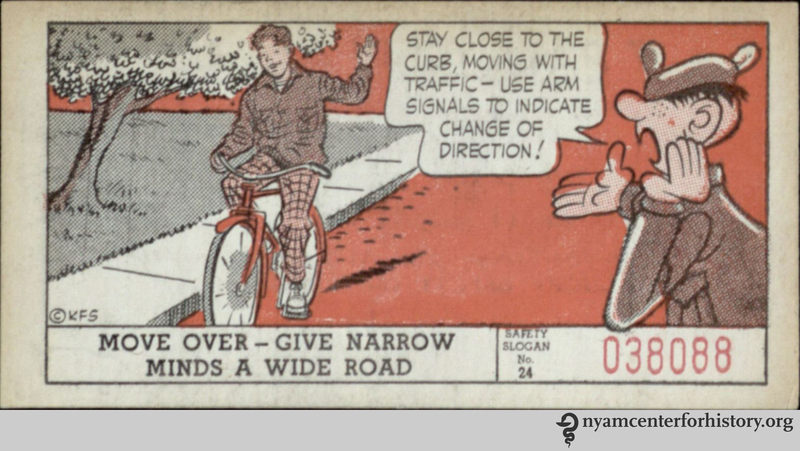 This entry was posted in Collections, History of medicine and tagged comic strips, ephemera, guest post, Lucky Safety Cards, public health, public health campaign by nyamhistorymed. Bookmark the permalink. Fascinating! I don’t have any of those cards, but I do have a book by Munro Leaf, “Health Can Be Fun” done with that two-color (black and red) printing) in cartoon style from 1943. I remember reading through it many times as a child.